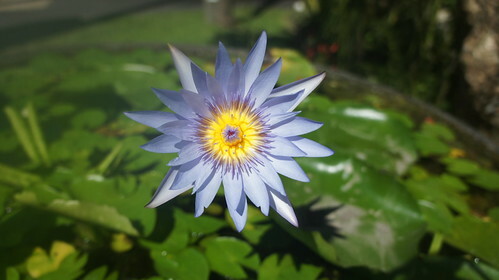 Bali is one of the Islands of Indonesia. It is known as the Island of Temples, Island of Peace Island of the Gods, Island of Hinduism, Island of Love. You can see the rich Balinese culture is already upon arrival at the airport, which is a typical construction. 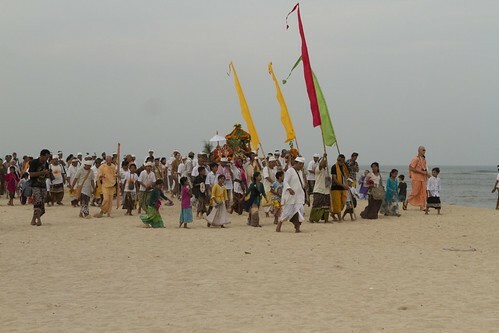 There are colors, music, spirituality, art and tradition everywhere in Bali! It has a population of about 3,891,000. Approximately 92% of the population is Hindu while in the other islands the vast majority is Muslim. And you don’t see violence around Bali. The traffic is crazy! Many motorbikes, horn all the time for anything, and small streets. But it seems that they understand each other! The first week I stayed in Ubud, one of the busiest cities of Bali, while Enrico was in Australia with his friend Eduardo Kiko (Dudu). 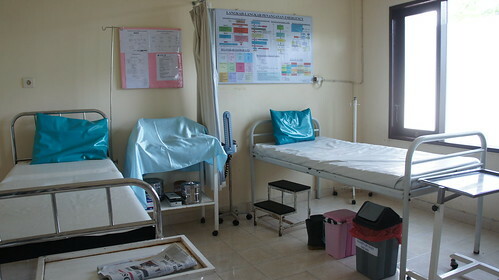 The main reason was to be near Bumi Sehat clinic. This organization has the midwife Robin Lin as the founder. I visited Bumi Sehat every day I was there. My idea was to do volunteer work there, but there were enough volunteers, working in several areas. And not many births happening that week, even with the full moon. So I was there observing the movement and talking with professionals, volunteers, midwives and mothers. You can read more about Bumi Sehat in the previous post. There I interviewed Ibu Robin Lin, Wine, Rena and Maya. Robin is the founder of Bumi Sehat. 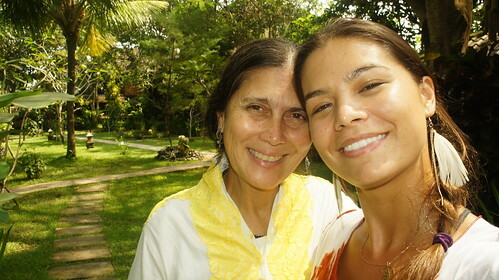 She started to offer free care for pregnant women and children under five for free in 1994 in Ubud area. 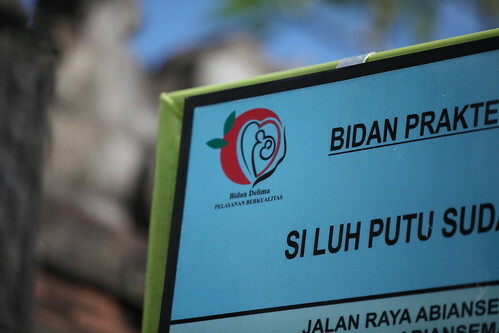 The demand grew and the clinic Bumi Sehat was founded in 1995. She is an exemple of compassion, love and determination. Wine is a beautiful balinese women, she is also Robin’s daughter-in-law, married with her son. She had a lotus birth at home, with the help of Grandma Robin. She is pregnant again! Wine is also a teacher of yoga for pregnant women in the clinic. 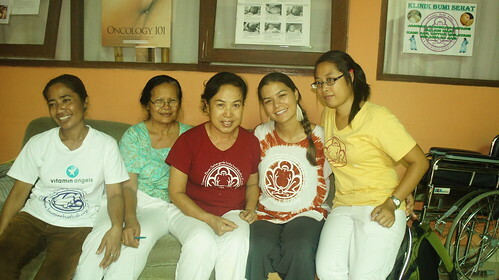 Maya is American and was working as a student volunteer, she told a little about her experience at the clinic so far. Rena is one of professional midwives at the clinic and is passionate about her work. She said the reality is very different in other hospitals in Bali and about the importance of loving care for the new mothers. This week I also met with Debra Pascali Bonaro , always smiling and radiating her wonderful light! 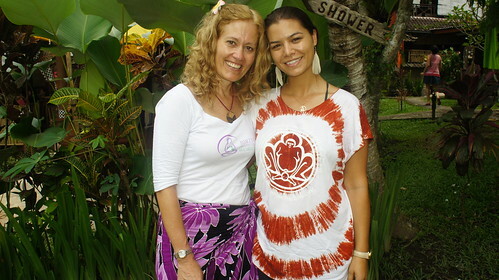 She was there to give the course Doula Eat Pray that had women from all around the world participating. It was great to meet her again, talk and share about the travels around the world! I also had the opportunity to speak briefly about the project to the group. 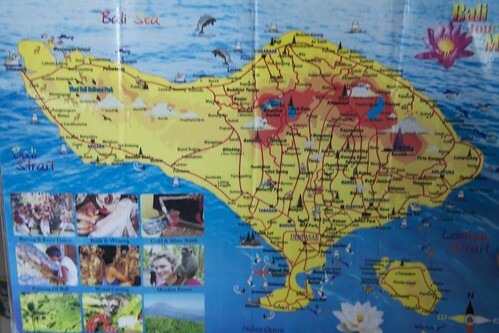 Besides visiting Bumi Sehat, I visited three clinics in Bali to know what happens at the other settings. They are private clinics and have the government license to operate. The only public hospital is in Dempasar, so many women end up having their babies at the local clinics. Usually I come in and ask to speak to one of the nurses / midwives professionals. When I have the opportunity I ask about birth for women, at the stores, restaurants, massage places, street. In one of the restaurants I went to lunch, the waitress was super friendly and had a very good English. She started talking about the planting of rice that was in front of the restaurant, which was the staple food and was always white. 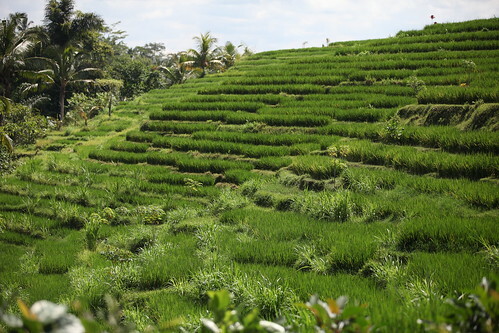 Many families have their own rice fields. The families are large. In Hindu culture when the woman marries she will live in her husband’s house, and add up the number of members at the house. But now the couples have less children. The schools are private and most health costs are also private. The subject with the waitress ended up in Birth, as always … She said she has two daughters, ages 5 years and 2 years and that they stay with their grandmother while she works, which are every day, 8 hours per day. If she has a day off, she has to recover the other day … and the monthly salary is very low. She said she had her children in nurses clinic in her community. She said they exist it in many communities. The next day we arranged to go visit this clinic together and she accept to be interviewed. She went to the clinic because the care is better and it’s closer from her house. The other day she was there in front of my hotel with her daughter so we could visit the clinic together. 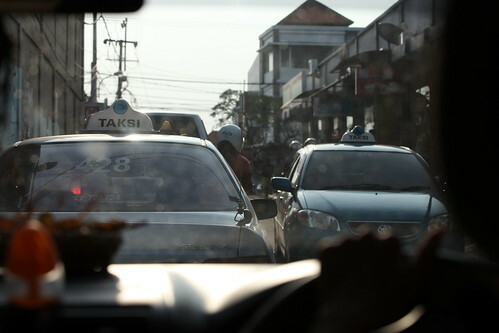 On the way we talked about the Balinese culture and her conflicts in her second pregnancy. We arrived at the clinic, looked like a home from outside. And one of the nurses lives on top of the clinic. They do prenatal, delivery, and also family planning, vaccines and pediatric care. The nurse declined to be interviewed, and was also busy. So Tara showed me the clinic, which is a room for appointments and one behind for the birth. 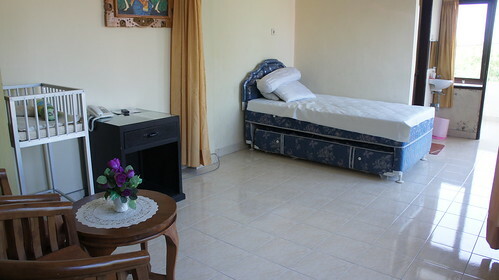 A small and simple room with two beds. I felt bad because her daughter was crying scared all the time we were there. She said it was because they normally go there for vaccinations. Might it be memories of the birth? Another clinic was in Nusa Dua. My friend Livia was with me. A very small clinic. The nurse showed the delivery room. A room with two beds for normal delivery. The nurse cares during labor, when gets near the time of birth, she calls the doctor. There was a woman in labor with the support of her husband. I asked the nurse to ask them if I could get in. With their permission, I went. She was lying on the bed side. We started talking, but the husband was the one answering. It was her first baby. She said the contractions were hurting. Each rush (contraction) that came she would contract, but without doing any sound. I asked if the back was hurting. She said yes. I began to massage the lower back slowly, and she began to relax more. I said that moving the hips move could also help …. She wanted to try. She moved out of the bed and started moving the hip while I was doing massage. She seemed more relaxed. I thought it was time to go because I was just visiting and when I realized I was there helping a woman in labor … I miss doing that! I left, but soon I came back because I have forgotten to give my card with my email so I could send the photos. I came into the room and she was standing, moving the hips and her husband massaging the back! I was very happy to see that! She and her husband smiled at me and thanked me, saying it helped a lot! I talked to the nurse and said that move, change positions, do massage during labor helps a lot! 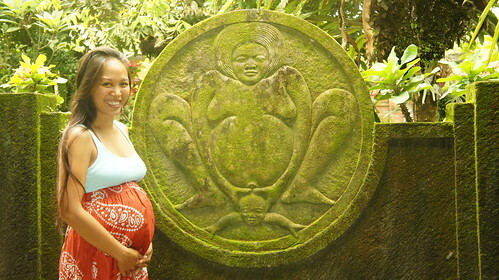 I suggested for her to visit Bumi Sehat in Ubud and see how the births take place there.. she seemed interested to learn. 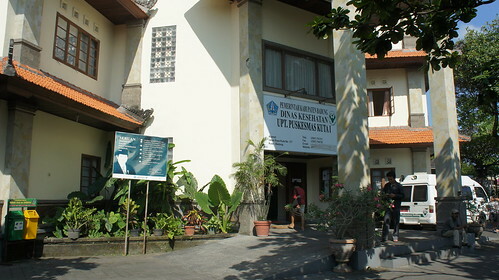 In Kuta I visited another clinic that is based in the care of nurses. It’s like a birth centre, where only normal deliveries take place, but without the philosophy of gentle birth. But it is well organized and clean. The nurse midwives Sukadani Ni Pt Ayu welcomed me and the clinic. There is a delivery room with two beds separated by a curtain. The deliveries always happen in the gynecological position as in the other clinics. The nurses did not know it could be different . If they need help in a complicated birth, they call the doctor, usually to use forceps or vacuum extraction during birth. The baby is born and taken to receive routine care. After, mother and baby go to the postpartum room together usually for two days. There is a private room and shared. The private sector is more expensive. I said : ” But you know that in my practice most mother chooses to have baby squatting!” , trying to not hurt them, but to say that there are other options… They looked to each other and gave and smiled, thinking it was a fun think to do: ” Oh, but here no, all women give birth laying down!” and they were proud of that, because it is more civilized! But I said the other positions could help the baby descend, could facilitate … they demonstrated interest in learning more about it, they told me to come back to give a course. Most professionals and women simply do not know another way for babies to be born …the have been conditioned to think that this is the only and best way to do it. Maybe next time I come back ready to give courses? This stayed in my mind … it would be another project! Who knows, maybe in the future … Living and Learning! Tem uma população de cerca de 3,891,000. Cerca de 92% da população é Hindu, sendo que a grande maioria nas outras ilhas é mulçumano. Por mais que seja um tanto movimentado nas cidades, e com pessoas com menor condições financeiras, não se percebe violência. O trânsito é uma loucura! Muitas motos se atravessando, buzinas o tempo todo, e ruas pequenas para a quantidade de carros e motos. Mas parece que eles se entendem! Na primeira semana fiquei em Ubud, uma das cidades mais movimentadas de Bali, enquanto o Enrico ficou na Austrália com nosso amigo Eduardo Kiko (Dudu). E o motivo principal foi para estar perto da conhecida clínica Bumi Sehat. Essa organização que tem como Madrinha a midwife Robin Lin. Nos dias que eu estava em Ubud visitava Bumi Sehat todos os dias. A minha idéia era fazer um trabalho voluntário lá, mas há haviam bastante voluntários, trabalhando em diversas áreas. Então ia lá para observar o movimento e conversar com os profissionais, voluntários, parteiras e mães. Conto um pouquinho de Bumi Sehat no post anterior . Por lá entrevistei Robin Lin, Wine, Maya Hensold e Rena. Ibu Robin Lin é a fundadora de Bumi Sehat. Ela começou a oferecer cuidado gratuito para as mulheres grávidas e crianças menores de cinco anos de graça em 1994 na área de Ubud. A demanda cresceu ea clínica Bumi Sehat foi fundada em 1995. Robin é um exemplo da compaixão, amor e determinação. Wine é nora da Robin Lin. Ela teve um parto de lótus em casa, aparado pela avó Robin. Ela está grávida novamente! Wine também é professora de Yoga para gestantes na clínica. Maya é americana e estava trabalhando como estudante voluntária, ela contou um pouco de como está sendo a sua experiência, lindo demais! Rena é uma das parteiras profissionais na clínica e é apaixonada por seu trabalho. Disse que a realidade é muito diferente nos outros hospitais e da importância do cuidado com amor. Nessa semana também me encontrei com a querida Debra Pascali Bonaro, sempre sorridente e irradiando sua Luz maravilhosa! Ela estava lá para dar o curso Eat Pray Doula que juntou mulheres de várias partes do mundo. Foi muito bom reencontrá-la, conversar e compartilhar sobre as andanças pelo mundo! Também tive a oportunidade de falar brevemente sobre o projeto para o grupo. Além de visitar Bumi Sehat, visitei 3 clínicas em Bali para conhecer o que acontece no outro extremo, como a Rena falou. Todas as clínicas eram privadas. O único hospital público é em Dempasar, então muitas das mulheres acabam tendo seus bebês nas clínicas. Geralmente eu chego e peço para falar com uma das enfermeiras/ parteiras profissionais. Sempre quando tinha a oportunidade perguntava de parto para as mulheres balinesas. Em um dos restaurantes que fomos almoçar, a garçonete, Tara, era super simpatica, falava bem inglês e ficamos conversando. Ela começou falando da plantação de arroz que tinha na frente do restaurante. Muitas famílias têm seus próprios arrozais. E as famílias são grandes. Na cultura hindu quando a mulher casa ela vai morar na casa do marido, e vão se somando o número de membros. Mas hoje os casais não têm tantos filhos como antes. As escolas são privadas e a maioria dos custos em saúde também são privados. O assunto acabou em parto, como sempre. Tara falou que tem duas filhas, de 5 anos e de 1 ano e meio e que fica com a avó enquanto ela trabalha, que são todos os dias, 8 horas por dia. Se ela tem uma folga, tem que recuperar nos outros dias… e o salário mensal é muito baixo. Ela falou que teve suas filhas em uma clínica de enfermeiras na sua comunidade. Ela disse que é comum e tem em várias comunidades. Combinamos de ir visitar essa clínica juntas e ela topou de ser entrevistada. São clínicas privadas e têm a licença do governo para funcionar. Ela foi para a clínica pelo atendimento ser melhor que no hospital público. No outro dia ela estava lá na frente do meu hotel com sua filhinha para irmos visitar a clínica. No caminho conversamos sobre a cultura balinesa e de seus conflitos com a sua segunda gestação. Chegamos na clínica, parecia uma casa. E uma das enfermeiras mora em cima da clínica. Elas atendem o pré natal , parto, e também fazem planejamento familiar, vacinas e atendimento pediátrico. A enfermeira não quis ser entrevistada, e também estava atarefada com os atendimentos. Então Tara mesmo me mostrou a clínica, que é uma sala para os atendimentos e outra atrás para o parto. 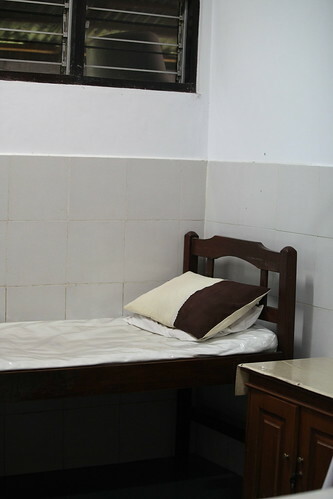 Uma sala bem pequena com duas camas, um ambiente não muito acolhedor, mas é ali que as mulheres têm seus bebês. Me deu uma dó porque a filha de Tara estava chorando com medo o tempo todo… a mãe disse que é porque quando elas vão ali é para fazer vacina. Ou seria lembranças do parto? Outra clínica foi em Nusa Dua. A minha amiga Lívia estava comigo. Uma clínica bem pequena. A enfermeira mostrou a sala de parto. Uma sala com duas camas para parto normal. A enfermeira controla todo o trabalho de parto, quando está chegando perto da hora de nascer, ela chama o médico. Havia uma mulher em trabalho de parto com apoio de seu marido. Pedi para a enfermeira perguntar a eles se eu poderia entrar. Com sua permissão, eu entrei. Ela estava deitada na cama de lado. Começamos a conversar, mas quem sempre respondia era o marido, acho que ela não entendia inglês. Eles falaram que ela o primeiro bebê. Ela falou que estava doendo as contrações. Cada contração que vinha via ela se contorcer, mas sem dar um pio. Perguntei se doia nas costas. Ela respondeu que sim. Comecei a fazer massagem na lombar devagar, e ela começou a relaxar mais. Falei que movimentar o quadril, se movimentar também podia ajudar…. Ela topou tentar. Levantou começou a movimentar o quadril enquanto eu fazia massagem. Ela parecia estar mais relaxada. Achei que era hora de ir embora, pois estava apenas visitando e quando vi já estava lá ajudando uma mulher em trabalho de parto… estou com saudades de fazer isso! Fui embora, mas logo depois voltei para ver como ela estava e para dar meu cartão que tinha esquecido de deixar, que tinha meu email para que eu pudesse mandar as fotos. Cheguei na sala e ela estava em pé, movimentando o quadril e seu marido massageando a lombar! Fiquei muito feliz de ver essa cena! Ela e o marido sorriram para mim e me agradeceram, falando que tinha melhorado bastante! Conversei com a enfermeira e falei que movimentar, trocar de posições, fazer massagem durante o trabalho de parto ajuda bastante! Sugeri que ela fosse conhecer Bumi Sehat e ver como os partos acontecem por lá, ela pareceu interessada. Em Kuta visitei outra clínica que é baseada no cuidado de enfermeiras. É como se fosse uma casa de parto, onde só acontecem partos normais, mas a filosofia do parto humanizado. Mas é bem organizada e limpa. As enfermeiras obstetras Sukadani e Ni Pt Ayu me receberam e foram muito atenciosas, mostraram toda a clínica. Há uma sala de parto com duas camas separadas por uma Cortina. Os partos sempre acontecem na posição ginecológica. As enfermeiras não sabiam que podia ser de outra forma. Se elas precisarem de ajuda, em um parto complicado, elas ligam para o medico, geralmente para usar forceps ou vácuo para extração do bebê. O bebê nasce e é levado para receber os primeiros cuidados de rotina. Depois a mãe e o bebê vão para o quarto de pós parto geralmente por 2 dias. Há o quarto privado e o compartilhado. O privado é mais caro. Eu falei para elas: “Mas você sabe que na minha prática no Brasil, a maioria das mães optam por ter bebê de cócoras!” , Tentando não machucá-las, mas para dizer que existem outras opções … Eles olharam uma para o outra e deram um sorriso, acho que elas acharam engraçado imaginar uma mulher tendo bebê de cócoras: “Ah, mas aqui não, todas as mulheres dão à luz deitadas, na posição normal! Como se fosse a melhor forma, mais civilizada! Mas falei que as outras posições podiam ajudar o bebê a descer, podia facilitar… eles mostraram interesse de saber mais sobre isso, e sugeriram que eu voltasse para dar um curso. A maioria dos profissionais e das mulheres simplesmente desconhecem outra forma para os bebês nascerem… foram condicionadas a pensar que essa é a única e melhor maneira! Quem sabe uma próxima vez que voltar venho pronta para dar cursos? Fiquei com esse pensamento na cabeça… seria outro projeto! Quem sabe no futuro… Vivendo e Aprendendo! from what I see in your videos you do a perfect job. congratulations to this blog and all your work. Próximo história Umbilical cord clamping: why to hurry?Corte precoce do Cordão Umbilical: para que a pressa?